Even on a sunny June day, a third of the storefronts up and down this stretch of 14th Street are dark; the For Rent signs plastered on the windows keep the piles of conduit and shelving remnants in shadow. Plastic bags and empty takeout containers collect in the doorways, and one window has a streaky, sloppy graffiti tag painted in glass-etching acid. But this isn't 1981, there's a Duane Reade at the end of the block and upper-floor tenants are paying thousands per month for shoebox apartments. This is high-rent blight. Commercial leases tend to be long. Restaurants average ten-year leases, and twenty-plus isn't unheard of for larger chain retail. With a fixed yearly percentage increase normally locked-in, landlords want to get the highest possible rent at the outset; taking a cheaper tenant means leaving lots of money on the table over the term of the lease. In a hot neighborhood, a tenant could end up paying below market by the end of the lease term as neighboring rents (and property taxes) increase. Rather than take the risk, landlords leave spaces vacant and hold out for big tenants. 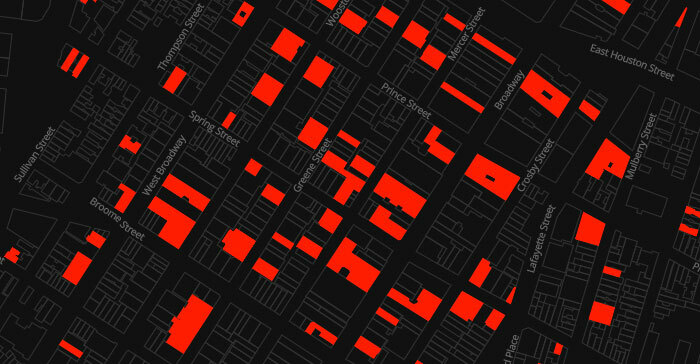 Rent in desirable, high-traffic locations is always expensive: a small Lower East Side storefront goes for $8,000/mo, cavernous spaces in glitzy midtown high-rises run into the hundreds of thousands (often hidden behind 'Call for price' or 'Negotiable' on listings.) The pool of tenants for a 2200sf, $36,000/mo restaurant space by Union Square is shallow, the one for a $1600/sf/yr space on Madison Ave (making that same restaurant $290,000/mo) is barely a puddle. Only the biggest chains can afford the spaces, usually at a loss absorbed by other stores. With a limited selection of tenants to woo, plus large corporations' glacial negotiating pace, expensive storefronts sit empty for years. I went to investigate on foot, and it's as bad as the map looks. 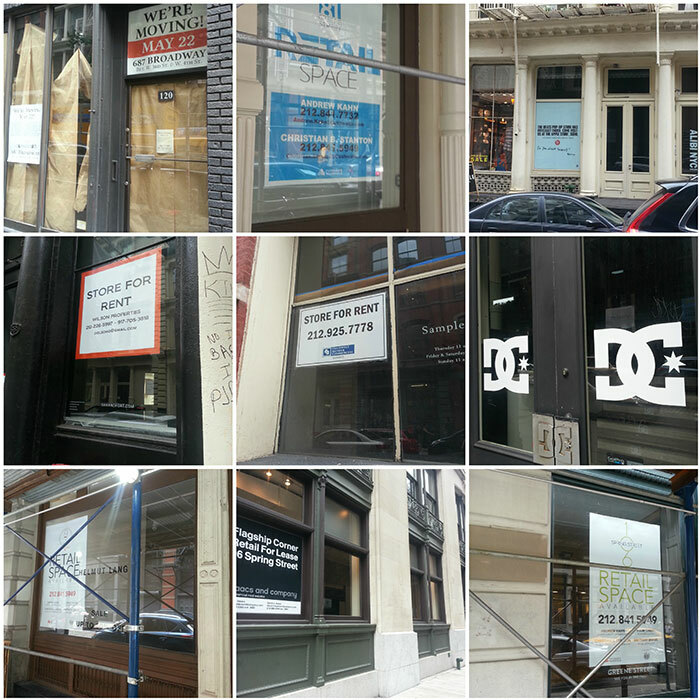 Circling one block yielded nine empty storefronts, most of them previously housing mid to high-end national brands, including Helmut Lang (home of the $360 hoodie). If these stores can't survive, who can? The incentives are out of whack. Supply and demand isn't working. Landlords with large portfolios of property, despite having significant (100+) vacancies, can't drop prices significantly without having a ripple effect on the rest of their portfolio. They can, however, take the loss from the vacant properties and shelter other income. Complex problems don't have simple solutions. It could be a series of sticks: a vacancy tax, an increase in tenants' rights through guaranteed leases and binding arbitration over rent increases (as outlined in the Small Business Survival Act). Or it could be carrots: tax breaks to small businesses to help ease the pain of high rents, or streamlined registration and a reduction of regulatory hoops for certain types of retail tenant. And further into the future, regulation: cultural landmarking, caps on rent increases, or limitations on chain retail presence. Every option has a valid series of arguments for and against: Wouldn't access to government funds via grants and tax breaks to the businesses drive rents even higher, like has happened with college tuition? 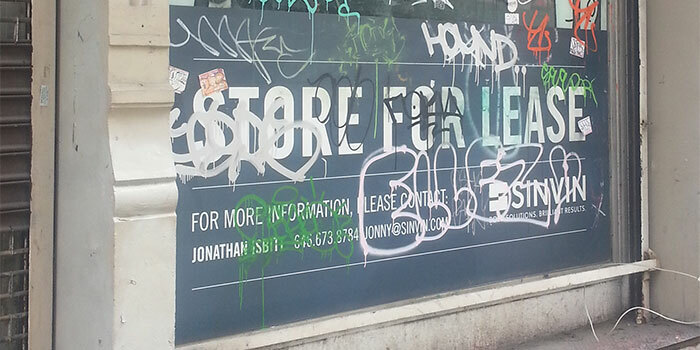 If a property owner wants to keep their property vacant, isn't that their right? But it's time to push forward, have the debate, and chip away at the problem. It's no longer just a tenant vs. landlord issue, it affects the landscape of the city as a whole. Share the map. Talk about the issue with your friends. Reach out to your senators and representatives (find your district here), community board, BID (or start one), and council members and express a desire to incentivize utilization of these empty spaces.